MH burned Nephthea... start them lower or shaded if going to boosted lighting from lower intensity or the wild. 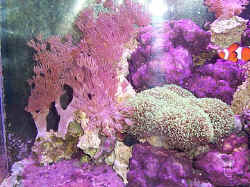 Coral competition <Anthony Calfo in your service> I have a few questions regarding competition for space in my aquarium. Which coral will win out over all for the space between an SPS coral growing next to a colony of polyps? <cannot be said in fairness categorically as each species is different. 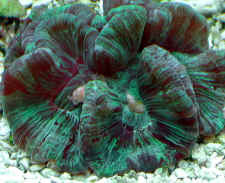 But in gross terms, Zoantharians (mushroom and zoanthid button polyps) are VERY aggressive and will often tame SPS corals. However, please do remember that corals forced to live close and combat are not necessarily win vs. lose. Sometimes both will suffer and or die after many weeks or months of being forced to compete> The polyps are zoanthids and the SPS coral is an Acropora that is growing branches. The Acropora is spreading out at the base as usual, but it is getting close to the polyps. <hard to say for certain... the rule is that no coral should be allowed to touch. Please frag the Acro to tame its growth or consider a "firewall" of rock/rubble for control of either animal. More about this in my book on coral propagation. Please do advise me if you need excerpts> I also have 2 small SPS corals that I glued onto the same small rock. Well as you can imagine they have both grown into fine looking specimens; <ah, yes... a common problem> however the base of one is growing onto the base of the other. They are both great looking corals and I do not want to break either of them off. What should I do? <they need to be separated. Even when they appear to be getting along, one will die "mysteriously" after some months from the silent chemical warfare> One is a brown and white Acropora with a thick base and thick branches. 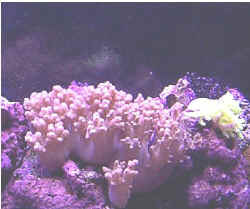 It's base is being grown onto by a Montipora capricornis. The Montipora is growing into whorls and looks awesome. Which will win the fight? 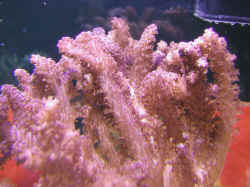 <the Montipora is going to get smoked like salmon by the Acropora...heehee> Any advise? <yep... buy a bigger tank, add a refugium for frags, place corals with consideration for long term growth/adult size and/or be more willing to frag corals to control growth of close specimens. Best regards my friend, Anthony Calfo> Thanks! !